Monday September 30th 1895 It was a beautiful day. I did some sewing. I made me a shirt. Will felt enough better this morning that he got out the machinery and began putting in wheat. He worked till four oclock when he came in nearly crazy with his shoulder hurting him. After supper Oliver went down for something for him to take. 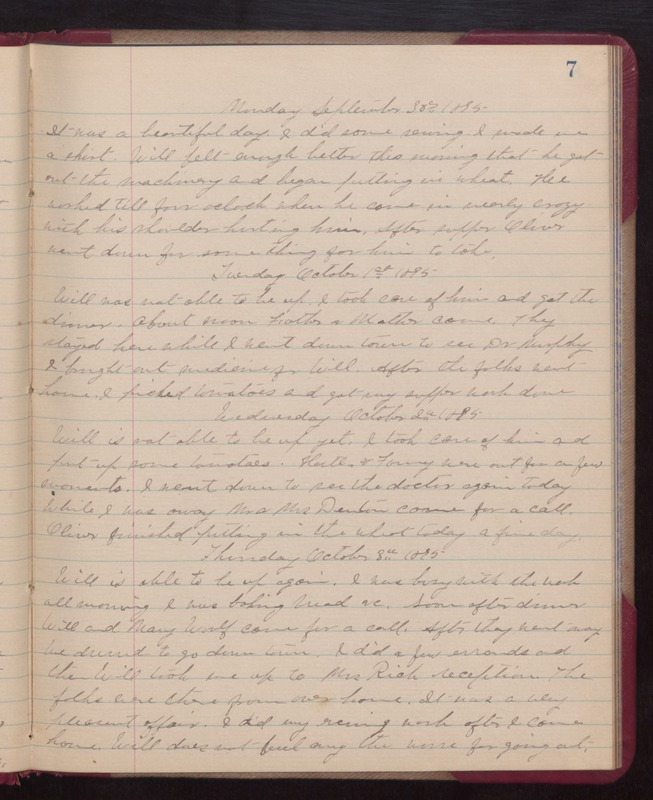 Tuesday October 1st 1895 Will was not able to be up. I took care of him and got the dinner. About noon Father and Mother came. They stayed here while I went down town to see Dr. Murphy. I brought out medicine for Will. After the folks went home I picked tomatoes and got my supper work done. Wednesday October 2nd 1895 Will is not able to be up yet. I took care of him and put up some tomatoes. Hatt & Fanny were out for a few moments. I went down to see the doctor again today. While I was away Mr. & Mrs. Denton came for a call. Oliver finished putting in the wheat today a fine day. Thursday October 3rd 1895 Will is able to be up again. I was busy with the work all morning. I was baking bread &c. Soon after dinner Will and Mary Woolf came for a call. After they went away we decided to go down town. I did a few errands and then Will took me up to Mrs. Rich reception. The folks were there from over home. It was a very pleasant affair. I did my evening work after I came home. Will does not feel any the worse for going out.